The Power Master is a £39 reverse polarity resistant, mains protection device that takes out Spikes and Surges and cuts power into the Motorhome/Caravan if the supply strays outside preset limits. These limits are user definable. Typically set to 190v to 260v, anything outside these results in the incoming mains being disconnected for 25 seconds. On detecting a 230v supply fault the unit stops the incoming power and isolates it. After 25 seconds it samples the supply and if it is now 'clean' it automatically reconnects. If the supply is still not within tolerance, it continues to be isolated and the unit samples again after a further 25 seconds, etc. The unit has a digital Voltmeter that displays the voltage entering the vehicle. It also has 2 warning lights that trigger if either under voltage or over voltage conditions occur. This unit not only smooths the vehicles incoming supply, but lets you monitor it in real time. It also has user definable Current limits that will shutdown the supply if a preset current limit is exceeded. Useful if you are on a 5amp EHU in Portugal, etc. This alterable current limit prevents unnecessary 'tripping' of the site Bollard's RCD, removing the usual 2 hour delay finding someone to come and reset it. By default it should be set to 16amps so also protects against accidental tripping of a UK 'full power' site 16a Bollard, as the Power Master should trip first. 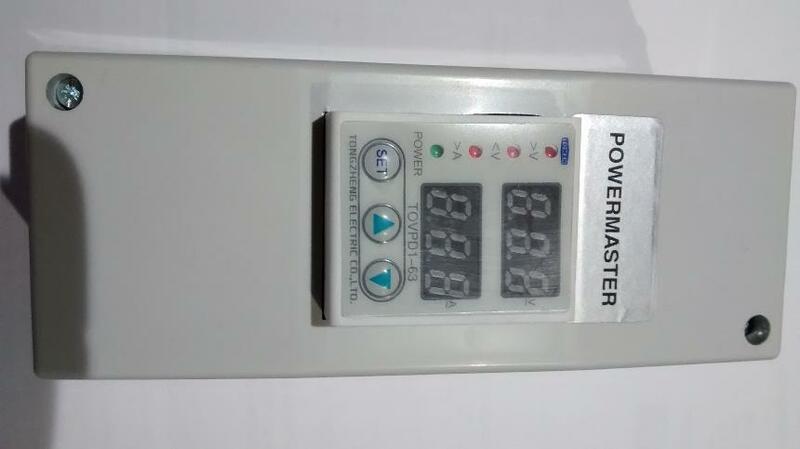 In addition to a digital Voltmeter, this unit also contains a Digital Ammeter displaying the current being drawn at any one time. The device is able to protect the motorhome from over voltage of faulty Inverters. Should an Inverter fault and output over 290v, these devices will chop the Inverter 230v output power and prevent damage to 230v appliances. They are also very good at protecting the motorhome from petrol generator induced spikes and surges, etc. The devices fit immediately in front of the existing RCD, taking about one hour to fit. It is compact at 6" x 2.5" x 2.5". Although It comes with full fitting instructions which are not hard to follow, we have to advise you, that this should be fitted by an experienced technician.